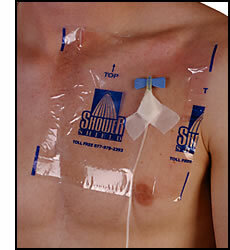 Shower Shield...the safe, economical and versatile way to protect your wounds and medical devices. Shower Shield water barrier consists of a polyurethane film with acrylic adhesive. Latex-free, it is safe for use on persons with latex allergies. It is clinically proven effective in keeping water away from the covered area while showering. By protecting wounds dressings with Shower Shield you reduce the risk of infection from waterborne bacteria. Shower Shield is more convenient and comfortable than other methods of covering the bandaged wounds, and means fewer dressing changes, which makes the patient more comfortable and saves money. Clean and dry area surrounding wound thoroughly. Make sure area to be covered has appropriate dressing. Shower Shield should not be allowed to come in direct contact with the wound. Clip any excess hair at the site. Shaving is not recommended. Always follow your physician's advice. Open poly bag and select appropriate size for application. Choose a Shower Shield bandage that is large enough to adhere to SKIN ONLY (not to wound, device or primary dressing). Peel the wax paper frame from the water barrier, exposing the adhesive surface. Position water barrier over the site. Gently remove the wax paper frame, smoothing the dressing down as you pull the frame away, pressing edges down firmly to adhere to skin. Firmly smooth water barrier from the center toward the edges. Gently grasp the edge and slowly peel the water barrier from the skin in the direction of hair growth or grasp one edge of the water barrier and gently pull it straight out to stretch and release adhesion, being careful not to disturb the primary dressing or device. Discard after use. Shower Shield water barriers are single use only. Non-sterile: Do not use if package is open or damaged. 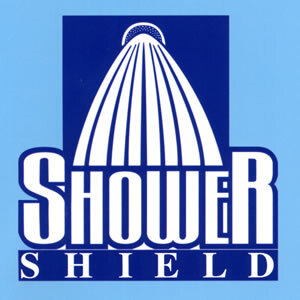 Shower Shield is not designed to come in direct contact with wound itself. Make sure area to be covered is covered with appropriate sterile dressing before applying Shower Shield. Do not place over nose and/or mouth. Do not use over the eyes. Do not allow children to handle Shower Shield without adult supervision. It could present a choking or suffocation hazard if misused. An adult should always supervise a child who has a Shower Shield on his or her body. Single use only. Store at room temperature. Contact your health-care provider immediately if you suspect that you have a medical problem or if condition persists or gets worse. When properly applied, Shower Shield is impermeable to liquids from brief contact. Shower Shield is not designed for submersion. Every medical condition is different, please contact your health care provider prior to use. Shower Shield - the safe, economical and versatile way to protect your wounds and medical devices.